Hotel Drakolimni is located in mountainous Tsepelovo in Zagori, amidst the Pindos National Park. It features a traditional dining room with fireplace. 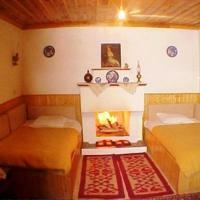 Its luxurious rooms have views to the village and the Tymfi mountain range. The warmly decorated rooms have autonomous heating and private bathrooms with hydromassage shower cabins and hairdryers. Each also includes a satellite TV, telephone and safe. Several units have a private fireplace. A buffet breakfast with organic jams is served each morning at the hotel, and can be enjoyed on the outdoor terrace, weather permitting. The restaurant serves a variety of local dishes in a warm and welcoming atmosphere. The hotel is 50 km from Ioannina. The area is ideal for outdoors sports and activities, such as trekking, rafting, canoe and more. Free private parking is possible on site. Centrally located in the scenic village of Tsepelovo, family-run Gouris is a traditional, stone-built mansion with rooms overlooking the garden or Mount Tsoukarniasa. Breakfast includes homemade pies, pastries and local butter. Featuring wooden ceilings and floors, local rugs and handicrafts, rooms at the Gouris guesthouse include a TV. Some rooms have a traditional fireplace. The village square with the imposing plane tree, shops and taverns is within 30 metres. The famous Rogovo Monastery is at 1 km. The town of Ioannina with Lake Pamvotis is 51 km away. Situated in scenic Tsepelovo, stone-built Faraggi is a family-run hotel featuring rooms with a fireplace and a furnished balcony overlooking Mount Tymfi. The hotel tavern serves homemade pies and traditional spirits. Featuring wooden ceilings and floors, rooms at the Hotel Faraggi include a TV and fridge. Each has a private bathroom with shower. A homemade breakfast buffet with traditional “trahana” soup, jams and fresh milk is served in the dining area with the fireplace. Guests have access to free Wi-fi access in the hotel’s public areas. Restaurants and shops are within a 2-minute walk from the hotel. The town of Ioannina is 51 km away. Staff can offer information on nearby sights such as the 11th-century Rogovou Monastery. Free, private parking is available on site. Situated in the mountain village of Tsepelovo, amidst lush greenery, the stone-built Kamares offers traditional accommodation with mountain or village views. It includes a restaurant serving Zagorian cuisine and it has a spacious lounge area with fireplace. 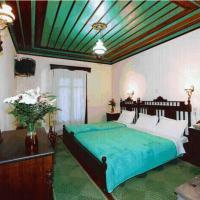 Rooms at Kamares hotel feature woolen rugs and carved ceilings. They all come with a private bathroom and a TV, while some also have a fireplace or a hydromassage shower cabin. At the on-site restaurant, guests can enjoy home-cooked specialities, such as local pies and traditional meat dishes. Hot beverages and drinks from the bar can be enjoyed by the fireplace. Within 50 metres of the property, guests can find cafes, taverns and a mini market. At 35 km, they can also visit Voidomatis River and Vikos Gorge, ideal for outdoor activities such as rafting or hiking. Wi-Fi access and on-site parking are offered free of charge. Situated 100 metres from the centre of Tsepelovo, traditionally built Xenonas Zagorisio features self-catered apartments with fireplace and balcony overlooking the village square and Mount Tymfi. The on-site tavern serves local spirits and homemade pies. Featuring rustic-style decoration with wooden ceilings and local artefacts, each apartment at the Zagorisio includes a seating area with a TV. All units have a kitchenette with fridge, cooking hobs and a dining area. Cafés and taverns are within 100 metres from the property. Staff at the 24-hour front desk can offer information on rafting and hiking activities in the area. The town of Ioannina with Lake Pamvotis is at 48 km. Centrally located in the scenic village of Tsepelovo in the Zagoria area, Archontiko is a 19th-century refurnished mansion. It offers rooms with free Wi-Fi and views to Mount Tymfi and the garden. A breakfast buffet is served in the dining area. A fridge, an electric kettle and a TV are included in all rooms at the Archontiko. Each has a private bathroom with shower. Some accommodation types have a seating area. Guests can have local drinks and coffee at the bar with the fireplace. When the weather is warm, the tree-filled courtyard is ideal for relaxation. The area is ideal for hiking, rafting and mountain biking. The scenic village of Vitsa is at 25 km. Monodendri village is 28 km away.